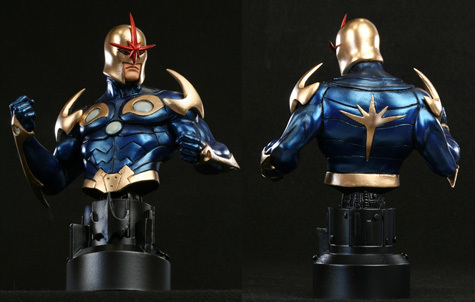 In September of 2010, Bowen Designs announced they would be producing a modern Nova mini-bust as part of their Phase V products for Marvel. The mini-bust measured over 6.5 inches tall and was priced at $80 with an edition size of 800. It was designed and sculpted by the Kucharek Brothers and painted by Danno. 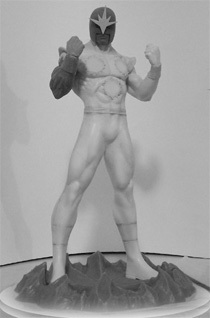 Bowen Designs made the statue available for pre-order in May of 2011. It arrived in stores in September of 2011. 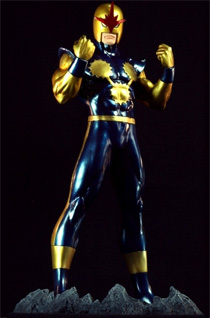 In March 2008, Bowen Designs announced they would be producing a Nova statue in the modern uniform as part of their Phase IV products for Marvel. It was originally planned to be in a flying pose but later changed to a standing action pose. The statue measured over 14.5 inches tall and was priced at $175 with an edition size of 800. It was designed and sculpted by the Kucharek Brothers. Bowen Designs made the statue available for pre-order in February of 2009. The statue arrived in stores in November of 2009. 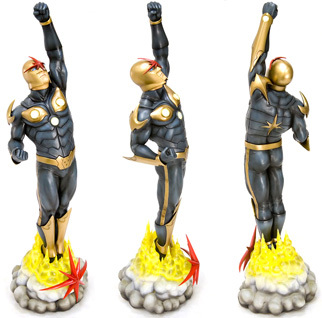 In November 2008, Japanese statue manufacturer, Kotobukiya, announced they would be producing a Nova statue for Marvel. The statue measured over 15 inches tall and was priced at $175. The statue also came with special enchancements. Those included special glow in the dark paint on the eyes and three energy regulators that are on the chest. The base of the statue had an LED light inside to give it an energetic glow! The Kotobukiya Nova statue had an edition size of 1,500. It was designed and sculpted by sculptor Junnosuke Abe. Kotobukiya made the statue available for pre-order in January of 2009. The statue arrived in stores in June of 2009. 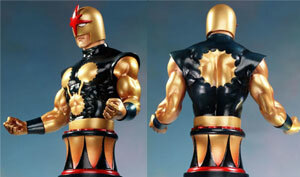 In February 2008, Bowen Designs announced they would be producing a Nova statue in the classic uniform as part of their Phase IV products for Marvel. The statue measured over 12 inches tall and was priced at $170 with an edition size of 1,000. It was designed and sculpted by the Kucharek Brothers. Bowen Designs made the statue available for pre-order in September of 2008. The statue arrived in stores in May of 2009. 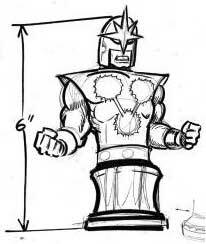 In May of 2004, Bowen Designs announced they would be producing a Nova mini-bust as part of their Phase II products for Marvel. The mini-bust measured over 6 inches tall and was priced at $45 with an edition size of 3,000. The sculpture was designed and sculpted by Carl Surges. Later, Randy Bowen made some slight changes to the mini-bust. It arrived in stores in April of 2005. 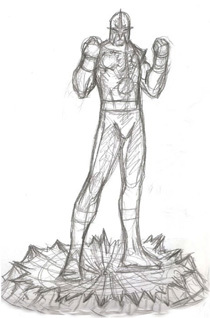 The original design sketch for the mini-bust. 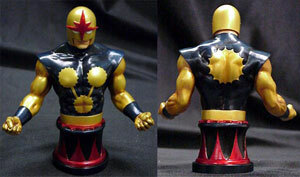 The first prototype of Bowen's Nova mini-bust. The photo was released in July of 2004. During the summer of 2004, Bowen Designs made some slight changes to the prototype and in September, they released the above photos. The changes includes a more golden paint on the body and a color scheme change on the base. Bowen Designs began accepting pre-orders on the mini-bust on September 24, 2006. Between September and December, Randy Bowen made some changes to the mini-bust. 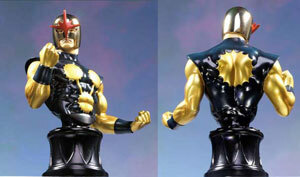 These changes included replacing Nova's white lenses with eyes, a higher placement of the right arm and changing the full torso to a more traditional chiseled cut. The base was also painted black and the golden paint on the body became more yellow. This photo was released in December of 2004.